Watchable, intelligent and provocative drama with a stunning central performance from Rachel Weisz but the film loses its focus in the second half and the finale lacks the impact it should have had. Directed by Alejandro Amenabar (Eyes Wide Open, The Others), Agora is set in 4th century Alexandria and stars Rachel Weisz as Hypatia, a philosopher and astronomer who teaches at the famous library and is loved by two very different men, her devoted servant Davus (Max Minghella) and her cocky student Orestes (Oscar Isaac). However, while Hypatia struggles with advanced scientific theories, she is unaware that the world outside is changing at a rapid pace: the Christians are gaining power, leading to violent clashes on the streets. Years later, the fighting still continues but Orestes has become a civic leader and is in a position to protect Hypatia, even though she continues to reject his advances. Meanwhile, Davus joins the Christian uprising, hoping to secure his freedom and declare his love for Hypatia. 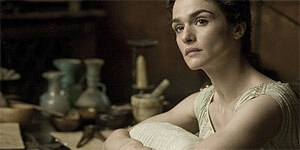 Rachel Weisz delivers a stunning performance as Hypatia, radiating both warmth and an electrifying intelligence that captivates both her students and the audience; watching her excitedly explore ideas about the earth and the universe (including a scene where she skirts tantalisingly close to the theory of relativity) is the film's chief pleasure, which is just as well, because it happens a lot. There's also strong support from Max Minghella, who has relatively few lines but powerfully communicates his love for Hypatia through looks, gestures and actions, such as a touching moment where he holds her foot while she sleeps. Amenabar handles the crowd and battle scenes well and the film makes great use of some inventive CGI work, with the camera frequently pulling back to show overhead views of the entire city, complete with tiny little people running about all over the place. The film's biggest problem is that the first half is much stronger than the second – the various political shifts are hard to adjust to (not helped by the fact that several key characters look the same) and the film drags considerably as a result, before rallying for a somewhat depressing climax. In short, Agora is worth seeing for a terrific performance from Rachel Weisz that more than justifies her dominant position on the film's poster.